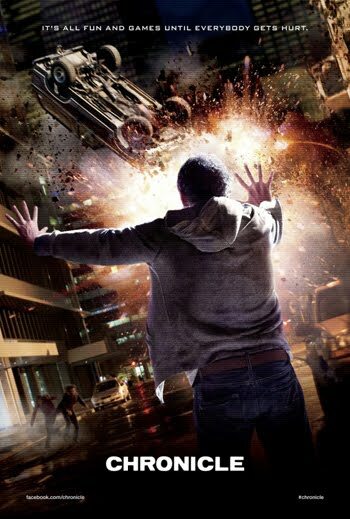 "Chronicle" at its core is a wasted film - a huge potential of greatness completely lost with a mind-boggling decision to go the found footage route. It is an unconventional film with elements that make it darker and deeper than your average superhero/scifi film. And yet it is presented in a very mainstream format and a very middling one at that. "Chronicle" is good enough for anyone to enjoy it but you just know this could have been better and greater than its current state and that is truly the most frustrating thing about it. Matt (Alex Russell), Andrew (Dane DeHaan) and Steve (Michael B. Jordan) gain superpowers after making an incredible discovery. They also find out that if they practice hard enough, their powers also grow stronger in time. First, they gain telekinesis and soon after that, flying. As expected, the three high school seniors use their powers for fun but soon they find their lives spinning out of control as one of them decides to use his power for his own selfish and devious purposes. the film feels and eventually develops. It's not all bad though as the director actually did a pretty good job using the found-footage format. Our favorite is the final scene were Andrew goes amok in Seattle and Matt tries to stop him. It was surely creative using other people's gadgets, CCTV cameras, police cameras and more to make the sequences move. It felt natural and most importantly, real. This is one of the best (if not the best) use of found footage we have seen. But there are also instances were things are forced as there needs to be a camera all the time. Additionally, a majority of the first half of the film is spent on the teens "experimenting" with their powers. The videos felt like current YouTube clips of fake stunts with CGI that is quite noticeable. These are the instances that you just know that the found footage format does more damage to the whole movie than aid it. What "Chronicle" really excels at is its story and the characters within it. The three lead actors all felt natural as their fictional counterparts and surely makes the film more believable. Amazingly, the film had great story and character development even with a bunch of separate clips joined together. You can just sympathize with the characters and you can totally see the changes in each one. One may find the power as a simple add-on to his life, the other as a serious thing to think and be careful about and the last one who decides to use his power to vent out his frustrations and anger in life. Even with their different takes on what to do with their new-found abilities, you can fully understand why each one thought that way - good or bad. While the first half was all fun and games, the second half takes a darker, grittier and more sinister tone that makes this film a worthy watch. This is how we imagine humans would react if they suddenly get God-like powers - not the way we usually see from comic books. In the end, "Chronicle" did not need to be a found-footage film. Choosing a regular format or even a combination of both would have made this an instant scifi classic.